Posted on Wednesday, July 11, 2018 by "T". Last Friday evening at the 2018 WSOP Event #66 $1,500 NLH, something said by a poker player to another fellow player led to his disqualification from the WSOP event. Adrian Sorin Lovin, a poker pro who registered from Russia but at the WSOP he wore blue shirts emblazoned with ‘Team Italy', had advanced to Day 2 in Event #66 with a fairly healthy stack. At that time, the initial field of 1,351 was narrowed down to 227, which was 24 spots from the money bubble. 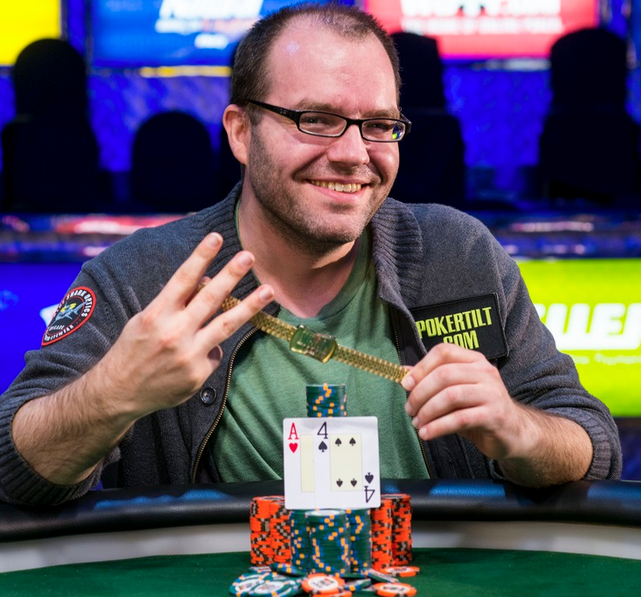 2014 WSOP: Dutch Boyd Wins Bracelet Number Three & $288,744! Posted on Wednesday, June 18, 2014 by "T". Dutch Boyd, a poker pro originally from Missouri who now resides in Vegas, won his third bracelet in Event #33: No-Limit Hold'em yesterday. The tournament attracted 1,688 players and Boyd was the only player with a gold bracelet to his name on the final table. Read more » 2014 WSOP: Dutch Boyd Wins Bracelet Number Three & $288,744!